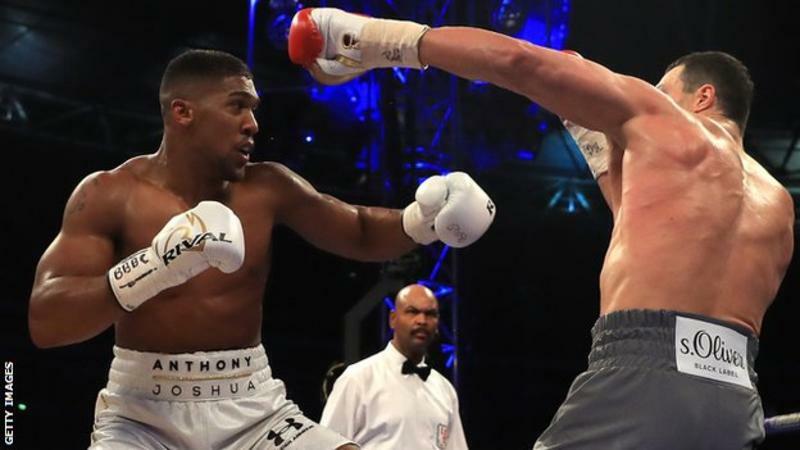 A rematch between unified heavyweight champion Anthony Joshua and Wladimir Klitschko could take place at Cardiff's Principality Stadium in October. Briton Joshua stopped Klitschko at Wembley last month to add the WBA world heavyweight title to his IBF crown. Wales' rugby union team will play at the Principality Stadium for most Saturdays in November and December, but 28 October could be a potential date. "Talks are ongoing over venues," said Joshua's promoter Eddie Hearn. Joshua's thrilling win over Ukrainian Klitschko was watched by a post-war record crowd of 90,000 at Wembley. Staging a rematch outdoors could be difficult in the autumn, but the 74,500-capacity Principality Stadium's retractable roof could make it a viable option. Hearn has said he believes a rematch "will go ahead" - even if it casts doubt over whether Joshua, 27, can retain his IBF title. The IBF has named Kubrat Pulev as a mandatory challenger, and says a fight with the Bulgarian must be next for Joshua. As such, the IBF appears obliged to strip Joshua should he opt for a return fight with Klitschko, but Hearn has indicated he will put in a mandatory exception request. Martyn Phillips, chief executive of both the Principality Stadium and Welsh Rugby Union, has previously said the governing body is "in conversations with various boxing promoters". The stadium has hosted speedway, rugby league, football and boxing, and Phillips says talks are continuing with the NFL. If Joshua were to fight at the Principality Stadium, it would be the fourth time Wales' national stadium has staged boxing. Welsh legend Joe Calzaghe beat Mikkel Kessler in front of an estimated 50,000 fans at what was then named the Millennium Stadium in November 2007. Calzaghe also headlined a bill against Peter Manfredo Jr in April 2007. The first major show at the stadium did not feature a Welsh fighter in the main event, with heavyweights Danny Williams and Matt Skelton headlining a bill also featuring Amir Khan. Get all the latest boxing news sent straight to your device with notifications in the BBC Sport app. Find out more here. To read the full piece from BBC Sports, click here.